Was kindly gifted a copy in exchange for an honest review. Well, what can I say?????? Loved loved loved this book. Its dark, its twisted and it keeps you on the edge of your seat and leaves you wanting more. Even though this is the first book in the series, you do need to read masters of passion as the characters and the story connects. 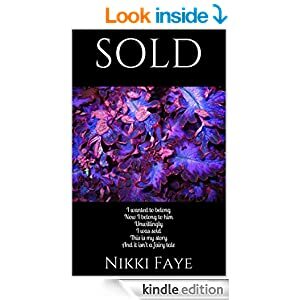 Nikki Faye is a very talented and must be read author and I really can not wait to read more of her work. I assure you, you will not be left disappointed. Wow. I totally loved sold. It’s starts off dark and dangerous, goes all romantic then ends dark and dangerous. Characters are entwined with her previous 2 books, masters of passion and taken so reading those before this book is a must to fully understand the goings on. Nikki Faye, you have done it again. completely and utterly left me wanting no needing more. Your work is amazing. Really looking forward to reading so much more of your work. Any Authors interested in sending me any books to read and review please email me at fiona_sheldon@blueyonder.co.uk, Dont forget to also send the date in which it needs to be reviewed by so I can update my calendar thank you ! !